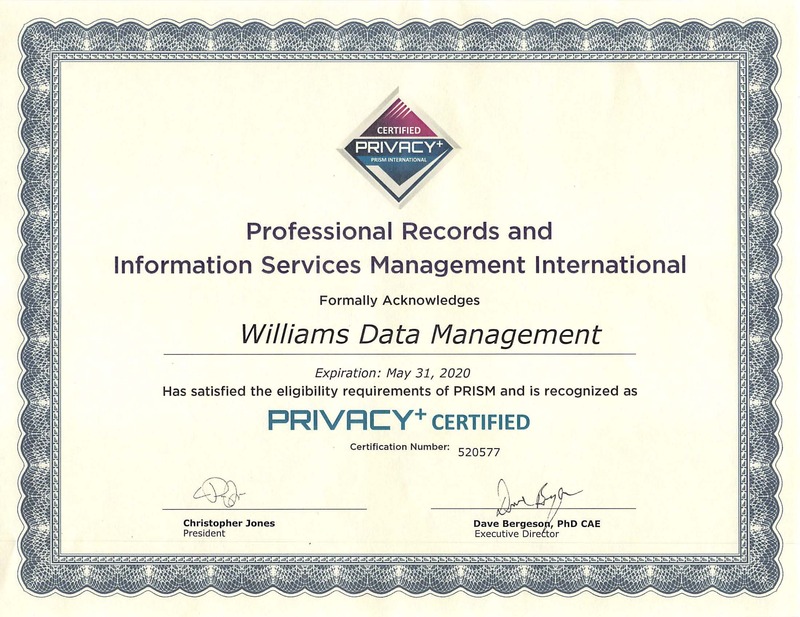 LOS ANGELES, CA, June 29, 2018 –Williams Data Management, a leader in Records Management, received its renewed PRISM Privacy+ Certification (Professional Records and Information Services Management), which solidifies the commitment to protect the physical storage and handling of hard-copy records and off-line removable media of its clients. With its renewed certification, Williams joins an elite group of companies who are PRISM Privacy+ Certified. Only 35 businesses in the world have received the certification and have committed to upholding the highest standards in safeguarding the storage of physical records. As the second half of the year approaches, Williams Data Management continues to uphold the mission and values promised to its clients, and the PRISM Privacy+ Certification reflects that. Williams Data Management specializes in Data Lifecycle Management. Operating in the Records and Information Management industry, it has been serving businesses throughout Southern California since 1922. The company is committed to records management and offers full-service solutions, including physical and digital records storage, document scanning and indexing, certified document and hard drive shredding, product destruction, business continuity planning, and Information Governance programs. Williams holds numerous certifications for data compliance and destruction including SSAE16, NAID “AAA” Certification, and is a member of PRISM International. For more information, visit www.williamsdatamanagement.com or call 888-478-FILE. PRISM International (Professional Records and Information Services Management) is a not-for-profit 501(c)(6) corporation based in Chicago, IL. The organization is global in scope and serves members in more than 60 countries around the world. For more information, visit www.prismintl.org.